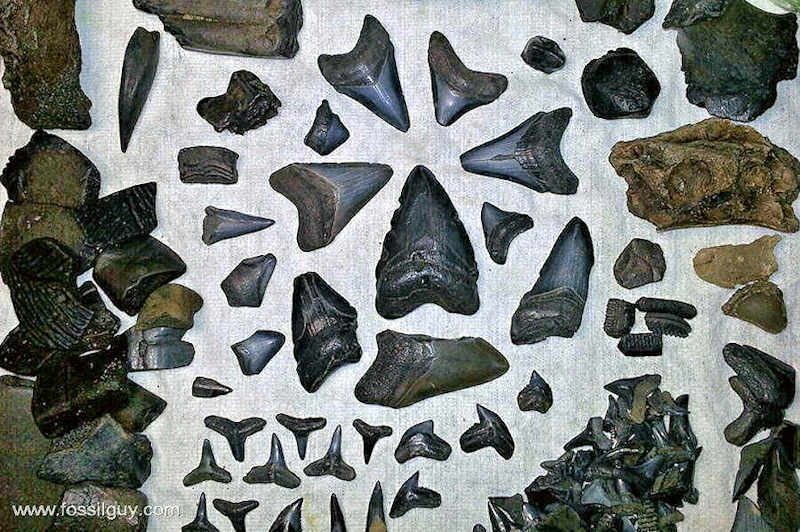 Fossilguy.com: Peace River Fossil Hunting: Shark Teeth and Ice Age Fossils. 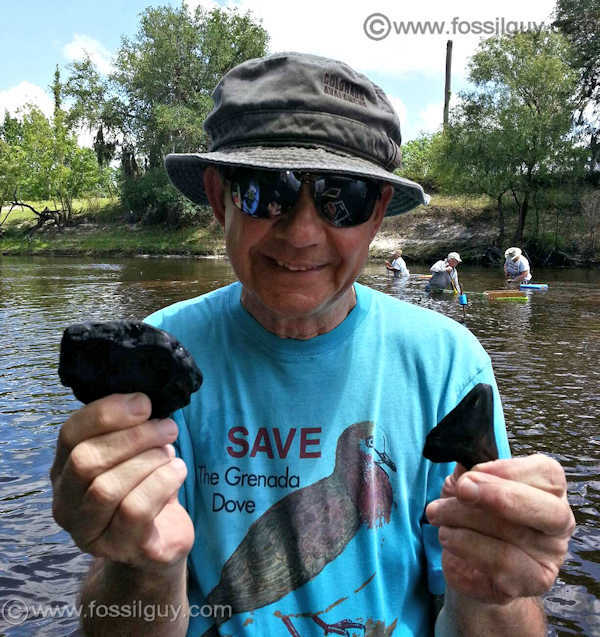 Remember to get your FOSSIL PERMIT before fossil hunting in Florida! A sampling of fossils found in the Peace River of Florda. Notice the nice Megalodon shark teeth! 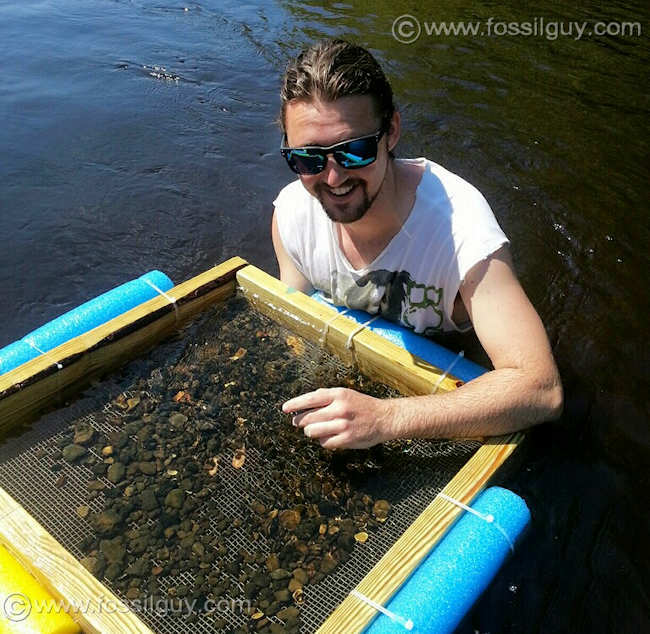 A Fossil Hunter sifting for fossils in the Peace River. So, how did Florida end up with countless fossils?? Let's start in the Cretaceous around 50 million years ago, when high sea levels caused Florida to be submerged. Florida stayed submerged for many millions of years. During this time at the bottom of the ocean, layers of limestone accumulated on the sea floor, creating the "bed rock" of Florida. Starting in the Oligocene, about 30 million years ago, the global climate cooled and sea levels began to drop. 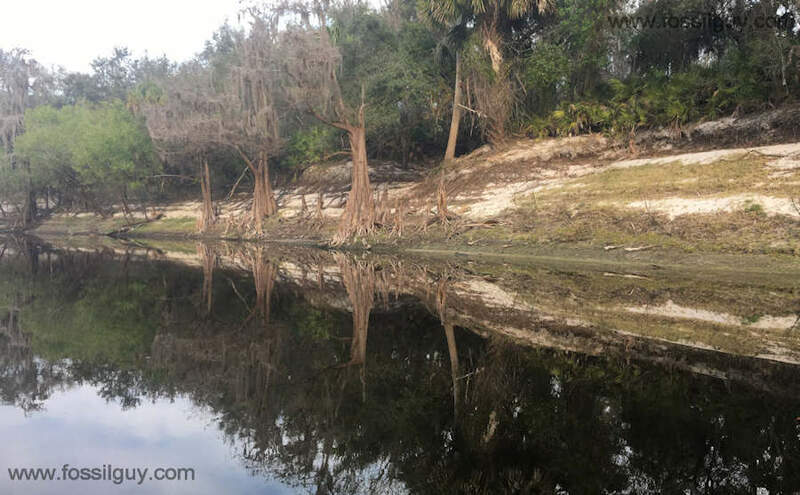 An island of limestone emerged in north central Florida called Orange Island. This was the first appearance of today's Florida. Rains eroded the porous limestone, creating the cave systems and sink holes common to Florida. Jumping ahead to 20 million years ago, into the next Epoch, the Miocene, tectonic activity deep beneath the Earth's surface caused uplifting around Florida. Orange Island slowly grew in size as it was raised from the ocean. Although the sea levels were in constant flux during the Miocene, Florida started to get its modern appearance. During this time land animals roamed central Florida, while a very shallow sea covered the coastal areas. At this time nutrient rich deposits washing from the Appalachia mountain building event created heavy sediment laden and nutrient rich waters. These sediments sank to the bottom entombing dead marine animals, countless teeth from sharks (including the Megalodon Sharks), and also land animals when the sea levels would rise. This trend continued until the Early Pliocene, about 5 million years ago. Today the sediments form the phosphate rich formations, including the Peace River Formation. This formation is mostly underground, but rivers, such as the Peace River, expose this formation. Also just off the beach near Venice, this formation is exposed. Besides for the Peace River fossils, there are also fossils from the Pleistocene. During the Pleistocene, from 2.5 million until about 11,000 years ago the Earth was (and still is) in constant glaciations events. During glacial periods, the sea levels would drop, and Florida's land would double in size. Ice Age animals lived here including Mammoths, Dire Wolves, Glyptodonts, Horses, and Giant Ground Sloths. During interglacial periods, the sea levels would rise, covering much of Florida. Sediments would bury and preserve the remains of these Ice Age animals. Today, remains of these Ice Age animals erode out of the layers of Pleistocene sands and gravels and wash into the Peace River. These Ice Age sand and gravel layers make Florida one of the richest places on Earth to find vertebrate fossils! Left Image: Florida in the Oligocene, showing the emergence of Orange Island. Center Image: Florida in the Early Miocene, during the Miocene uplift event. Right Image: Florida in the Pleistocene during maximum glaciation/low sea level. The following book: Geologic History of Florida: Major Events that Formed the Sunshine State is a great book filled with lots of illustrations. It covers the entire geologic history of Florida. It starts with Pangea and goes until the formation of the Florida Keys. Check it out if your an avid amateur paleontologist in Florida! Fossils erode from the banks and bottom of the Peace River and collect in gravel areas. The information below shows you how to hunt for these fossils. In order to fossil hunt vertebrates on state land in Florida, you must have a Fossil Permit. Anyone can obtain a fossil permit. Fossil Shark teeth are specifically excluded, but in the Peace River, you will be finding more than just shark teeth, so be sure to get a permit first. The permit application, permit renewal, and additional information from the FLMNH is here: FOSSIL PERMIT. In the state of Florida, it is illegal to collect artifacts on public land. If you find arrowheads, pottery shards, or or any other type of artifact, toss them back into the river. It's best to fossil hunt along the Peace River when it has not been raining. If the river is running high, the gravel areas may not be accessable. Also, a high river means fast currents, which can be dangerous. As mentioned above, you are sifting for gravel on the bottom of the river, so you want the river height to be relatively low. The USGS has water level gauges along the Peace River. Below are some recommeneded river heights and real time river heights. At Arcadia, you want the water to be around 1 foot in height or lower. At Zolfo Springs, you want the water to be around 7 feet in height or lower. Looking for fossils is fairly simple. It requires finding a gravel area on the bottom of the river and sifting it with a shovel and sifter. In order to search the river, people usually rent a canoe or kayak and paddle up or down the river looking for a "perfect" gravel spot. If you don't want to canoe or kayak, you can simply find a public access point (listed in the Locations section below) and wade into the river. 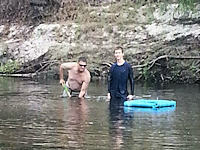 The gravel is on the bottom of the river, so wade into a shallow area and test the bottom to see if there is gravel. When you find a spot, start sifting! Most people use a shovel and sifter to sift for fossils in the river, so you will need a shovel and a sifter, or a shovel/sifter combo. This is a sifter designed for shark tooth sifting. The nice thing about the sifter is that it floats! Floating sifters are a BIG help for sifting along coastal areas and rivers, like Venice or the Peace River! This one is 15" x 15" and has the recommended 1/4" mesh and a rope for easier handling. Fossils erode from the banks and bottom of the Peace River and collect in gravel areas along the river. 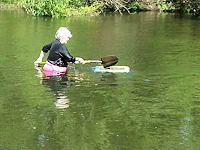 Usually people will paddle up or down the river in search of a gravel spot. The Peace River is slightly over 100 miles long, so you can spend years looking for perfect gravel areas! Below are locations where you can rent canoes and sift for your own fossils. The boat rental places below are not endorsed by the website, but are here to help you find a boat rental location on the Peace River. Make sure you check the water level heights in the "How to" section above. Don't Want to Paddle? Simply go to a public boat ramp and walk along the river to find a gravel spot. This canoe rental company is located in the heart of the Peace river in Arcadia. Here is the website for Canoe Outpost Peace River. They also have a place near Zolfo Springs. This canoe rental company is also in the heart of the Peace river in Arcadia. Here is the website for Canoe Safari. To find all of the ramps, check out the Florida Public Boat Ramp Finder and do an advanced search for the Peace River. Don't get close to baby gators and gator nests, the mothers don't like it! If you bring small pets, keep an eye on them, gators have been known to snack on them. Yes, there are poisonous snakes in the river, if you don't know what's poisonous, it's best to stay away from snakes in general. Yes, there are biting flies, ticks, and other nasty bugs. Use bug spray. Yes, it can get hot! Bring plenty of water, sunscreen, and a hat. If you managed to make it to the river when the water is too high or a storm comes through, don't risk it, stay out of the river! 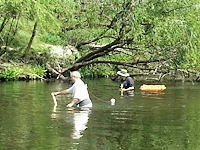 Usually you will fossil hunt when the water level is low. Often, the low level and snagged trees will force you to carry your boat on occasion. Being in good physical shape is recommended. This book is from Mark Renz, the author of the Megalodon book. It mainly concentrates on the Pleistocene fauna, such as the fossils found at Peace River. This book is, again, a great resource book. It has a 34 page identification section in it! This book is only for the seasoned collector of the Pliocene and Pleistocene fossils of Florida. It has 100's of images of mammal bones and teeth from mainly the Pleistocene. There are numerous comparisons of Bison, Camel, Horse, Tapir, Bison, Giant Sloth, Dire Wolf, Dugong, teeth and many more! If you have a child that like fossils and wants to fossil hunt in Florida, this is THE book! It's a very short book around 20 pages that concentrates on the most famous fossils found in the Peace River, including mastodon, giant ground sloths, and megalodon. It is geared toward getting children interested in Floridas rich fossil past and even includes coloring pages. A nearby fossil collecting site.